Like most nations and international organizations, the European Union has eagerly adopted social media over the past two years. And like most foreign ministries, the E.U.’s digital diplomacy apparatus amounts to a social media empire consisting of countless twitter channels and Facebook profiles. On twitter, one can choose to follow the E.U.’s Foreign Policy Service, various E.U. agencies, E.U. diplomats, E.U. embassies located around the world and even topics addressed by the E.U. such as human rights, health, employment and economy and finance. When attempting to locate the European Union in the social network of foreign ministries, I chose to analyze the E.U.’s Foreign Policy Service (@eu_eeas) twitter account. Located near the heart of this social network, the European Union’s foreign policy service is extremely popular and is the eleventh most followed foreign ministry in the entire network. While these figures are impressive, we should be cautious not to surrender to the “tyranny of numbers” when evaluating digital diplomacy. The fact that the E.U.’s Foreign Policy Service attracts a large audience is important but the more important question is does this Foreign Policy Service engage with its audience? Does it realize the potential digital diplomacy in facilitating dialogue and building relationships with global and local audiences? Or does it use digital diplomacy as a tool for information dissemination much like the radio or television? A partial answer to this question surfaced last week as the Europe Day celebrations were marked by the E.U. 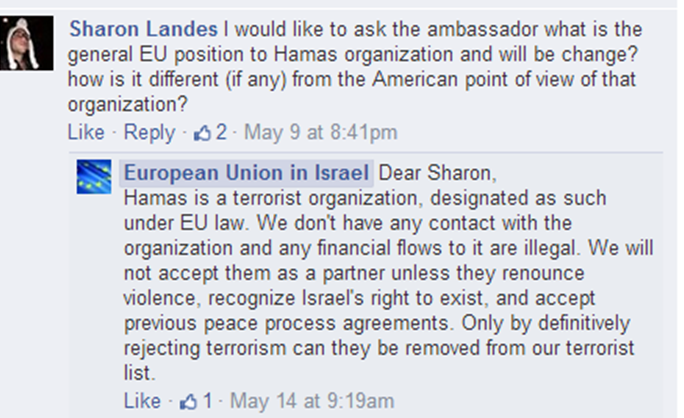 embassy in Israel in two manners: A meeting between E.U. Ambassador Faaborg-Andersen with Israeli journalists and a Q&A session on Facebook. While the former is a familiar example of public diplomacy; the latter is a prime example of digital diplomacy. Advertisements in Israeli newspapers and Israeli news websites called on Israeli Facebook users to pose questions to the ambassador either before or during the live Q&A session. The topics addressed by Facebook users ranged from the E.U.’s response to the Crimean crisis to the promotion of human rights and the lack of military intervention in Syria. Yet as could be expected, the majority of questions dealt with the Israeli-Palestinian conflict. Users asked if the E.U. would recognize the future Palestinian government which is expected to include members of the Hamas terror organization. Users also voiced concerns regarding the possible use of E.U. funds to finance terrorist activities against Israel. Numerous questions dealt with the E.U.’s involvement in the Mid-East peace process with some users wondering if Europe was “obsessed with Israel”. Unflinching in face of criticism, Ambassador Faaborg-Andersen took time to answer even the most complex and strongly worded questions. 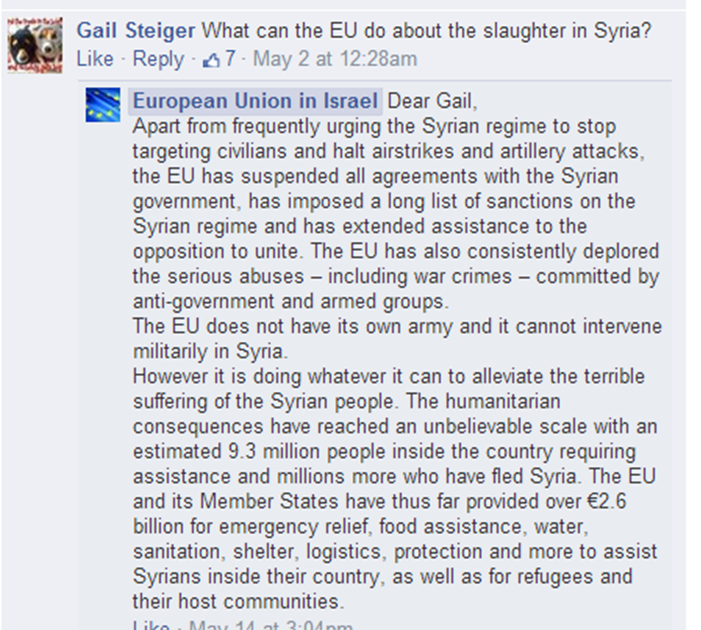 Interestingly, the Ambassador used this online chat to address a peculiar reality in which many Israelis view the E.U. as being Anti-Israeli while the scope of cooperation between Israel and the E.U. is substantial be it in the area of trade or joint programs to advance Israeli innovation and technologies. It is hard to believe that one Q&A session was enough to alter the popular perception of the E.U. in Israel or transform the users from Euro-Skeptics to Euro-Enthusiasts. Yet when people gather to ask questions, there is an opening for persuasion and, even more importantly, a willingness to open channels of dialogue. The questions posed to the Ambassador must now be analyzed by the E.U.’s embassy in Israel in order to learn how the E.U. and its policies are perceived by Israelis. While the two hundred people that participated in the chat do not represent all Israelis, they do represent those Israelis who are active online, who are willing to engage with the E.U. and who may be willing to listen what the E.U. has to say. In other words, this is exactly the target audience of digital diplomacy. It is important to note that online interaction between embassies and online followers should not be the exception to the norm but the norm. Social media directors at the embassy level must continually engage with followers be it in answering questions, responding to criticism or providing information. Only then will the potential of digital diplomacy be realized – the creation of relationships between nations and foreign audiences. Posted in Uncategorized and tagged Digital Diplomacy, European Union, Facebook, Israel, social diplomacy, Social media, Syria. Bookmark the permalink.